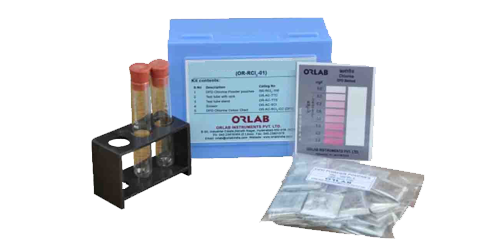 Sulphate Test Kit - Orlab Instruments Pvt. Ltd.
Procedure: Small amount of sample is collected in a test tube and the corresponding reagent is added to the sample. Turbidity is formed which is proportional to the sulfate concentration. The test is based on the turbidity method using a single pouch reagent . The test range is 40-200 mg/l as So4. The range can be expanded to 4000 mg/l SO4 if the sample will be diluted. Sulphate ions in the sample react with barium in the sulphate reagent and form insoluble barium sulfate turbidity. The amount of turbidity formed is proportional to the sulfate concentration. Double tube assembly, 5 ml graduated syringe, Scissor,pK/100 pouches sulphate reagent,cleaning brush, instruction manual in a Flute Board box.